I was just on vacation in the beautiful Zillertal. For those who do not know where it is … That’s in Austria. This, in turn, is the land where the flowers always look as if painted. I sat there every night on the terrace and looked into the mountains and saw these great flowers everywhere. 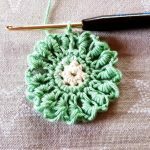 After a few days, I had just finished a project (let yourself be surprised!) 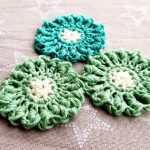 it came to my mind to crochet a few flowers. 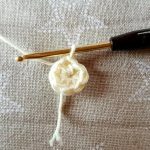 In all likelihood I will bombard you – after all the mobiles – now with flower instructions. 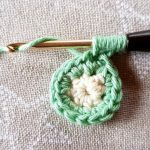 Let’s start with the flowers in the bullion stitch. 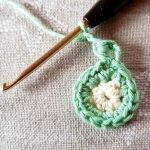 I think they are not for beginners, because the bullion stitch is a bit more difficult, but see for yourself! I tried to give as much information and assistance as possible. 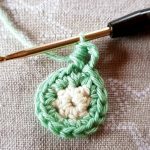 Have fun copying the flowers in the bullion stitch! 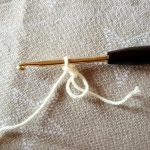 Short note from my side: You do not have to pull the last thread through all the threads on the needle at the same time. You can do that piece by piece as well. Just at the beginning I almost got a knot in my fingers, because it simply did not work. So keep calm, at some point you have the hang of it! 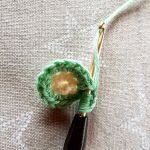 If you prefer to see the stitch in the form of a good video, go to Garnstudio here. 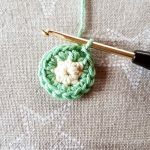 The flower in the Bullion Stitch is crocheted in rounds. 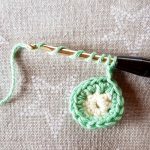 The size you can vary a little bit, in which you start after the magic circle with less half double crochet. 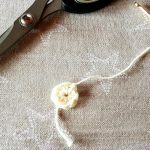 Here we cut off the white thread again and start with a colored thread again. 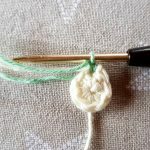 Of course you can continue to work with the same thread if you want to make the flower in one color.